Total lunar eclipses are rare, only about one in three lunar eclipses are total. About four to five total eclipses can be seen at any place on Earth in a decade. Lunar eclipses usually do not occur in any specific order. However, every once in a while, four total lunar eclipses happen in a row. This is called a lunar Tetrad. The total lunar eclipses happen 6 months apart. There are at least six full Moons between two total lunar eclipses in a tetrad. Italian Astronomer ” Giovanni Schiaparelli ” calculated that the occurrence of such tetrads varies over centuries. Some 300 year intervals have several lunar tetrads, while other 300 year intervals do not have any. For example, the years between 1852 and 1908 did not have any tetrads, whereas the next 3 centuries will have 17 tetrads. The first Blood Moon eclipse in a series of four happened on the night of April 14-15, 2014. The second one took place on the night of October 7-8, 2014. At that October Blood Moon, there was a total lunar eclipse. Blood Moon term originate from religious background after April 2014, at least according to Christian pastor John Hagee, who wrote a 2013 book about Blood Moons. 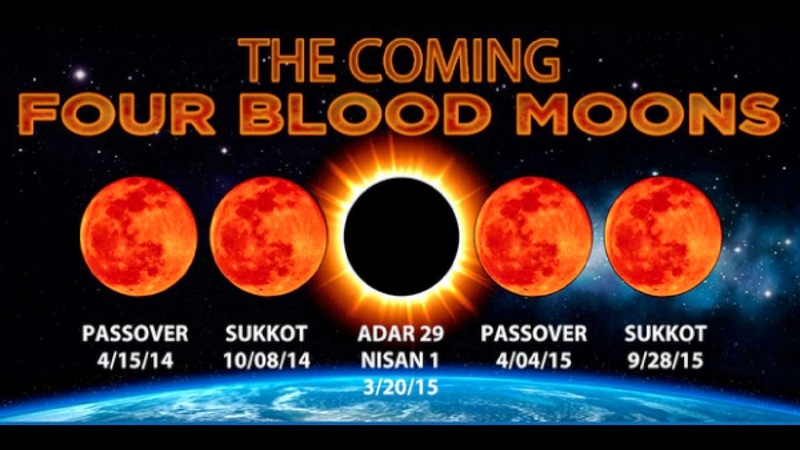 The Blood Moon Prophecy is a theory studied and taught by some Christian ministers, such as John Hagee and Mark Biltz, which states that an ongoing Tetrad (a series of four consecutive lunar eclipses, coinciding on Jewish Holidays, with six full moons in between, and no intervening partial lunar eclipses) which began with the April 2014 lunar eclipse is a sign of the end times as described in the Bible in Acts 2:20 and Revelation 6:12. In Support of Blood Moon Prophecy, from April 2014 to till date eclipse, got the idea of interpretation for doing initial research & analysis based on the series of astronomical patterns of eclipses from 2014-2015. I was quiet assured only astrological mathematics and calculations will help me to find out the reasoning behind prophecy and started collecting events Information’s and Data from April 2014 to till date. I was much surprised to see all the facts and figures related to mundane events which were commenced after April 2014 to till date, as they were so much accurate in its timing around the astronomical patterns. All the numbers, facts, figures & event details are very much close to mundane events when i matched it with Eclipses Duration and planet transits period. Though it Stunned me for a while & confirmed my sub-conscious thought of Nature phenomena into reality that every Astronomical Patterns has deep rooted link with Humans psychological behavior which can leads them to act irrationally and sometime it makes them too much fanatic to do anything for a condition of do or die for any religious reasons ( i.e Killings and Massacre ) and same thing we are experiencing in Mundane world too as off now, after all everything is relative to each other as what Einstein said in his theories. Nature every composition is made up of smaller ” Atoms “, ” Microorganisms” to Micro sub-atoms, from Nature to Universe to God Cosmos (God Particles) – all are interrelated with each other, exactly act in a same way. If we take Newton & Murphy Laws – Both are pointing us toward actions and reactions probabilities and laws which are happening in nature. Newton Law : ” To Every action there is Equal and Opposite Reaction ” – Either it is s celestial action or human action – it has to come in any form or any nature or any event in a same way – either it is acceptable for humans or not , But every nature Law has Some reasons and reactions according to situations we promote, results are common in occurrence as we are seeing every day around our environment. Murphy Law : “Things will go wrong in any given situation, if you give them a chance,” or more commonly, “whatever can go wrong, will go wrong.” – Every Species or an object has duration of degradation or decay process – it will goes in that direction in any nature or environment when perfect time frame will come. So, from above nature equations it s true to say that – Every Event in nature has Chains of reactions as per our Situations, Probabilities and happenings either it is in celestial world or in a mundane world. Things gone Happen and nature gone react.It can applies to everything constituent in nature, objects to people living in this earth, Changes and happenings will happen as every start has an its end or every beginning has its point of destruction or its end and than new beginning, so it will happen for you sure, some of them are in our hand and some of them we cant change. Those who are controlled by us , if we give them a chance, they can be avoided but if cant it will goes in that direction (Means in our State of mind). So every actions or happening in astronomical world has some cause & effects on us and which is true by nature law & by all mean, it will happen, might be today or might be after 100 years later but it will happen for sure- That is called nature. Nature itself is an expansive in nature and works on Law of changeability, Time Factor, Motion, Gravity and exactly relative to our solar system patterns. Because of Deep Exploration for Blood Moons theory, Facts exactly matched with Astronomical patterns which gave me accurate results for somewhat situation like Prophecy of 4 Blood Moons as predicted by John Hagee few months back. Although it wont be sign of end of Mankind, its just a sign of Something which can bring humanity into deep Destructive mode for period of time from April 2014 to 2015 or might be up-to 2016 but it wont be an end – that’s why it is named as ” State of transformations and Destructive Era for Mankind and Humanity” which was so much true in its accuracy with the events. After doing all the Statistical Research on Pre & Post Eclipse results, its true to say that it has deep relation with series of Mundane events and Happenings which are occurred after April 2014 and still we are seeing it globally across the world. After analyzing all the pre and post results of Blood Moon Eclipses with major planetary transits in different signs and stars, found whenever any astronomical patterns occurs or any celestial bodies changes above our universe – It can give strong impact on human Psychological activities & behavior i.e, sometime it can force you to act irrational exactly during the solar eclipse period, more often it can give you irritative behaviors and may be you often indulge in verbal or physical conflicts with others if eclipse is strongly impacting in your place – Sometime too much brutal behaviors has been seen or sometime it can make you too much fanatic which can bring any human mistakes i.e have seen killing after eclipses increases suddenly, gradual rise in Terrorist activities has been seen after solar eclipses – Mass Violence and killings has been seen after solar eclipses, Emotional brutality also increased after lunar eclipse and every human act has shown me sound proof of destructive era after blood Moon eclipses with astronomical transits, logically as well as scientifically proven correct, based on Statistical data we have seen after April 2014. During major solar eclipses, birds and insects will often lapse into an eerie silence. Those that generally sleep at night will actually begin to get ready for a nap, while nocturnal animals begin to wake up and move around.There was significant change observed during exposure to normal sunlight and eclipse phase. Bacterial colonies showed difference in morphology on smear examination and sensitivity pattern during this study. One fungal species and three bacterial isolates were studied and changes were recorded. Fungal species showed a definite change in their morphology on exposure to sunlight during eclipse observed by stained smear examination from broth, plate, and slant ( research done in Institute of Medical Sciences and Research Center in Manga-lore).Post Solar Eclipses usually increases possibility of higher magnitude of earthquakes – Heated issues seen in Politics and Major activities seen in Troops for counter attacking terrorist activities, Political Crisis seen in countries, Massive violence have been seen in mass, Solar Storms increases, Geo magnetic activities increases in sun – Rise in killing also increases after April 2014 in comparison to 2013 year. Lunar Eclipses were more prone to give cyclonic storms, heavy Rains, emotional disturbances in psychological patients, suicidal tendencies, rapes, earthquakes in islands and oceans. Finally, i can say we should need to get ready to experience nature most amazing Miracles and Happenings after ending & beginning of 2014-2015 year. Based on Research and analysis from April 2014 to till date now, we might see beginning of new era of transformations (as what Scorpio Sign signifies) in major political systems, in most of the countries globally across the world.There might be possibility of beginning of ” War Like Situations in those countries already going in conflicts – closer to eclipsed effected areas & Transit effected countries”. We can observe global increase in diseases (i.e Swine flue, Ebola and many more Microorganism based diseases).Natural happenings can be more effectively seen after series of Eclipses and Transits – i.e Assassinations, Political Crises, Political Conspiracies, Heated Issues with Neighboring countries, Massive Killings, National Disturbances, Terrorist activities, Violence, Natural disasters – Earthquakes, Cyclones, Heavy Rains and Sudden increase in Micro Diseases too. Based on 2014-2105 conflicts analysis, collected from different-different sources found stunning statistics regarding the death toll in the world’s for year 2014. Shockingly to say stats showing more than 28% higher rate than the previous year, with bloodshed in Syria was worse than all others for the second year running. 1) According to a study released by the Project for the Study of the 21st Century think tank – Conflict in India claimed 976 lives in 2014. 2) Fighting in Yemen claimed 1,500 lives in 2014. 3) The Israel-Palestinian conflict claimed 2,365 lives in 2014. 4) Fighting between rival groups in Libya claimed 2,825 people in 2014. 5) Fighting in Central African Republic claimed 3,347 lives in 2014. 6) Fighting in Ukraine took the lives of 4,707 people in 2014. 7) The conflict between Pakistan and the Pakistani Taliban killed 5,496 people. 8) Fighting between rebels and government forces in South Sudan killed 6,389 people in 2014. 9) More than 76,000 people were killed in Syria in 2014 and at least 14 separate wars killed more than 1,000 people in 2014. 10) In Ukraine, the shoot-down of Malaysia Airlines Flight 17 on July 17 2014 killed all 298 aboard. 11) Crash of Trans-Asia Airways Flight 222 killed 48 in Taiwan, Air Algeria Flight 5017 crashed in Mali, leaving at least 116 dead. 12) Unexplained loss of Malaysia Airlines Flight 370, with 239 aboard, in March 2014. Below mentioned astronomical patterns & mundane events will blow your mind after seeing the accuracy of events w.r.t to Blood Moon Eclipses and Major transits, all the mundane events are either occurred within 15 days Before the eclipses or after the 15 Days of eclipses and maximum up-to 1 month. Astrological Research has proven series of consecutive eclipses are main cause for massive disastrous events or loss in life’s via wars or killings. We have seen a Magnitude 8.2 earthquake struck offshore of Iquique, Chile on April 1, 2014 , which was 14 day Before Blood Moon Lunar Eclipse at a depth of 20.1 km (12.5 mi). The earthquake caused at least 7 deaths and triggered a tsunami of 2.11 Meters. The 2014 Iquique earthquake struck off the coast of Chile on 1 April, with a moment magnitude of 8.2, at 20:46 local time (23:46 UTC). The epicenter of the earthquake was approximately 95 kilometers (59 mi) northwest of Iquique. The main shock was preceded by a number of moderate to large shocks and was followed by a large number of moderate to very large aftershocks, including a M7.7 event on 3 April. The mega-thrust earthquake triggered a tsunami of up to 2.11 meters (6.9 ft) that hit Iquique at 21:05 local time (00:05 UTC, 2 April) Similar-sized tsunamis were also reported to have hit the coasts of Pisagua and Arica. At the time of earth Quake it was Running Shukala Pakasha tritya ( Means 3rd day after the full moon day) and 14 day earlier before Blood Lunar eclipse which was going to happen on Libra Sign and on Aries axis Sign. Again its a strange fact to notice, when earthquake occurred on 1st of April 2014 on 20:46, it was ” Libra ” Ascendant Rising with Rahu and Saturn on Lagana ( Clearly telling me a disaster or a Strong damage and affliction to Lagana of nation ) , Mars was in the 12th house of destruction ( 3rd house to Chile Natal chart – Neighboring nation also gone effect by this badly). Jupiter was in 9th house to Libra Ascendant at the day of Earthquake and 12th house from the chart of Chile ( Again a Trine formed of destruction and loss – (Jupiter- Saturn) both are in mutual Angle, Mercury + Venus were in trine to Jupiter and Saturn and from Libra and same both will be in 8th house from Chile Natal Chart ), Confirming me Libra sign was the epic point of Earthquake. 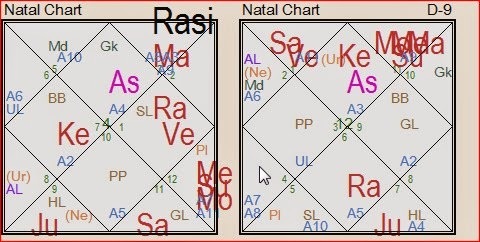 Chile Ascendant Chart is of Cancer and Both Saturn & Rahu was in Libra , was falling in its 4th house – Ketu + moon in 10th house from it, Impacting both 4th(lands) and 10th house (Work Area), Jupiter in 12th house and Mercury and venus in 8th house ( House of destruction – sign of relief, though moderate planets (Venus + Mercury) were there in 8th house, so it wont give mass destruction to people, Moon movement in Mercury Star usually indicates the day of event ) – overall a strong clue of earth gone shake badly in Chile. Intensification of fighting in Eastern Ukraine between Russian-backed military forces and Ukrainian security forces, with potential overt Russian military intervention. Conflicts started in Don-bass (Ukraine) after 6th of April 2014 when demonstrations by pro-Russian and anti-government groups took place in the Donetsk and Luhansk oblasts of Ukraine, together commonly called the “Donbass”, exactly 8 days before Blood Moon eclipse and when Moon (Lord of 8th house – Destruction and transformation) transited in 11th house ( House of Social Gathering and Social issues) in Libra Sign (Sign of Mass Movement with People for revolution or bringing change) with Rahu and Saturn (Karka for Notorious or rebellion actions influenced by Political Benefits) – So everything is indicating Huge Social gathering or Social mass movement of Notorious people started in Ukraine, & after with the Blood lunar eclipse in 11th house, Mass killing also got increased as a case of revolt, as 8th lord Moon joined with Rahu and Saturn on 15th of April 2014 which confirms the Conflict will shape into major military action and national Conflict for Ukraine. Exactly it happened and Russian Military Started Intervention in Don-bass (Eastern Ukraine) after 6th of April and These demonstrations, which followed the annexation of Crimea by the Russian Federation, and which were part of a wider group of concurrent pro-Russian protests across southern and eastern Ukraine, escalated into an armed conflict between the separatist forces of the self-declared Donetsk and Luhansk People’s Republics (DPR and LPR respectively), and the Ukrainian government which gives the death toll reached over five thousand. Still Military issue is going on till Jupiter is very much active. During the first stage of the unrest, Crimea was annexed by the Russian Federation after a crisis in the region, Russian military intervention, and an internationally criticized referendum. Protests in Donetsk and Luhansk oblasts escalated into an armed separatist insurgency. Since April 2014, after the Sub-lord of Saturn started in Jupiter Mahadasha ( Ascendant lord Dasha ) , Russian-backed separatist forces have battled the Ukrainian military in the east, where the death toll is over five thousand. Retrograde Saturn is lord of the 3rd House (Neighboring countries – Showing Power or Military Invasion) with 8th lord Moon (Death of Innocent people – Terrorized by Neighboring nations) in 2nd house from Ukraine Natal Chart – Clearly telling me Strong desire or interest from the Neighboring Nations in the matter of Financial Condition of the Ukraine because of the long pending conflicts. 2nd house is Heavily afflicted by the 8th lord and 3rd lord Which means Nation is going to draw heavy losses on due to long pending Conflicts or the emergencies implanted by the Neighboring nations. As Saturn Sub-lord was up-to August 2014, Ukraine felt badly and still issues is going on. If we look at deeply in Ukraine Natal Chart Jupiter MD started in 2013 in 9th house in Leo Sign ( The Sign of King Throne – Laws and Forces) , with 6th lord (Conflicts, diseases, war and killing) Venus, Sun and 10th lord Mercury, closely conjugated in Magha Nakashtra with A6 Arudha ( Military actions and Conflicts) – Clearly telling me there will be Huge Political crises will crop up in Jupiter Mahadasha, Ascendant lord affliction always shows Serious damage to the country. On the night of Blood Moon Lunar Eclipse of 14–15 April 2014, 276 female students were kidnapped from the Government Secondary School in the town of Chibok in Borno State, Nigeria. At the Night of 14-15 Moon was passing over Mars closely to Join Rahu and Saturn in Libra Sign – Indicating Some sort of Brutality or applying emotional force over Virgin Girls, Young Girls (Virgo Sign) or abducting them for political benefits is clearly Seen on the day of Event. Sun was Just entered at 0 Degree with South Node (Ketu) at the same day – Again clue of Some sort of Political crisis may going to take place. Responsibility for the kidnappings was claimed by Boko Haram, an Islamic Jihadist and terrorist organization based in northeast Nigeria. Between 14 and 18 May 2014 exactly within 1 Month after Lunar eclipse, a low-pressure cyclone designated Tamara and Yvette, affected a large area of Southeastern and Central Europe, causing floods and landslides. Serbia and Bosnia and Herzegovina suffered the greatest damage, as the rain was the heaviest in 120 years of recorded weather measurements. On 20 May, at least 62 people had died as a result of the flooding, and hundreds of thousands had been forced from their homes. Towns of Obrenovac in Serbia and Doboj in Bosnia and Herzegovina account for most victims, after being inundated by waters several meters high from nearby rivers. All the events occurred within 4- 5 days of difference when Nodes, Sun & Moon were ingresses toward their next signs, Sun was moving toward Mercury in Taurus Sign in ” Kritika ” Star from 29 degree to 0 degree – One of Major shifting in weather conditions. At the time when floods started in Bosnia and Herzegovina on 14th of May 2014 Moon joined with North Node (Rahu) and Saturn was in Libra and Moon was moving toward Capricorn ( the Sign of Bosnia ) from Scorpio to Capricorn. Usually Sun and Mercury Conjugation or earlier shifting gives continues rain and flood like situation because of heavy rain. North and South node was depressing toward Virgo sign again indicating major shifting in weathers conditions, In Most of the cases North and South depression gives condition likes catastrophes or sudden climatic changes or destruction’s in mass level. Uranus was Closely conjugated with Venus in Star of ” Revti ” in Pisces. Major Planets responsible for heavy rains and flood like situations are Sun, Mercury and Moon. On the Day of 20th May Moon was in Capricorn sign. Floodwater caused over 2,000 landslides across the Balkan region, spreading damage across many towns and villages.The rains activated torrents and mudslides, and subsequently several rivers in watersheds of Sava and Morava rose and flooded surrounding valleys. Official counts indicate that over 1.6 million people were affected in Serbia and Bosnia, after a week of flooding. On June 23, 2014 , Massive Earthquake Shakes Aleutian Islands in Alaska exactly 5 Days after Jupiter Transit @19th of June 2014, in Cancer Sign ( Watery Sign – Sign of Oceans and Islands) . Sixty-seven miles beneath the western Aleutian Islands, a portion of the massive Pacific tectonic plate was straining mightily today to plunge deeper into the Earth’s interior And then, at a little before 1 p.m. local time, it suddenly wrenched free, triggering a magnitude 7.9 earthquake that shook the tiny island town of Adak about 200 miles to the East. As Per Study, After June 2014, there was an Explosive Growth in ISIS (Jupiter Being Expansive in nature), Analysis has shown during 2014 and 2015 there has been dramatic shifts in ISIS activities and with the transit of Rahu(North Node) in Virgo in July 2014, it has been prominent across the world. Pro-Russia Separatists shoot down a military plane in the east, killing 49 people. Exactly after when Rahu Transited from Airy Sign to Earthy Sign (i.e Libra(Airy) -Virgo(Earthy)) in Virgo Sign on 14th, July 2015, Malaysian Airlines Flight 17 (MH17/MAS17) scheduled international passenger flight from Amsterdam to Kuala Lumpur crashed on 17 July 2014 after being shot down, killing all 283 passengers and 15 crew on board. After the transit of Jupiter in Cancer sign and Rahu Transit in Virgo Sign ( in ISRAEL lagana/Asc ) – Conflicts Started with Gaza and Israel Started its Military Operation on 8th July, 2014 in the Hamas-ruled Gaza Strip. Thereafter, seven weeks of Israeli bombardment, Palestinian rocket attacks, and ground fighting resulted in the deaths of over 2,200 people, the vast majority of them Gazans exactly after, When Rahu transited in its 1st house – Which clearly Meant Serious threat to Nation Security and Safety. In September 2014 when Close Conjugation of Mercury + Rahu and Moon occurred in 5th of September 2014 in Virgo Sign , Jammu and Kashmir (India) region witnessed disastrous floods across many of its districts caused by torrential rainfall. The Indian administrated Jammu and Kashmir, as well as Azad Kashmir, Gilgit-Baltistan and Punjab in Pakistan, were affected by these floods. By September 24, 2014, nearly 277 people in India and 280 people in Pakistan had died due to the floods. The Jammu and Kashmir state and adjoining areas received heavy rainfall from 2 September 2014 onwards, during last stage of monsoon in India. Hudhud caused extensive damage to the city of Visakhapatnam and the neighboring districts of Vizianagaram and Srikakulam of Andhra Pradesh. Damages were estimated to be 21908 crore (US$3.4 billion) by the Andhra state government. At least 124 deaths have been confirmed, a majority of them from Andhra Pradesh and Nepal, with the latter experiencing an avalanche due to the cyclone. On 24 October 2014 on very first day after Solar eclipse , ISIL militants launched two attacks on Egyptian army positions in the Sinai Peninsula, killing at least 33 security personnel. This was one of the deadliest assaults on the Egyptian military in decades. A series of shootings occurred on October 22, 2014(Day before Eclipse), at Parliament Hill in Ottawa. At the Canadian National War Memorial, Michael Zehaf-Bibeau fatally shot Corporal Nathan Cirillo, a Canadian soldier on ceremonial sentry duty. He then entered the nearby Center Block parliament building, where members of the Parliament of Canada were attending caucuses. After wrestling with a security guard at the entrance, Zehaf-Bibeau ran inside and was cornered and killed by the Commons Sergeant at Arms, Kevin Vickers, after a shootout with parliament security personnel. In Mexico the disappearance of 43 students in Guerrero within Month after 23rd of October, apparently at the hands of local police with links to organised crime, triggered massive, sometimes violent, protests. Increases in Hostilities between India and Pakistan continued along Kashmir’s Line of Control (LoC) Exactly after 23rd of Solar Eclipse and the working boundary dividing Pakistan and India-administered Kashmir, with each side accusing the other of unprovoked firing. Severe Terrorist attack Seen over Indian Military troops in October- November – December 2014. Suddenly after Transit of Saturn into Scorpio (Hidden Sign of Micro diseases) Swine Flue Cases Started Sudden growth after November 2014 to Feb 2015 , The maximum number of cases (155) was reported in Gujarat, where 55 people succumbed to the disease followed by Maharashtra with 42 deaths and 112 cases. Karnataka and Punjab reported 294 cases and 33 deaths and 56 cases and 30 deaths respectively. On 16 December 2014(within 1 month of transit), seven gunmen affiliated with the Tehrik-i-Taliban (TTP) conducted a terrorist attack on the Army Public School in the northwestern Pakistani city of Peshawar. The militants, all of whom were foreign nationals, included one Chechen, three Arabs and two Afghans. They entered the school and opened fire on school staff and children, killing 145 people, including 132 schoolchildren, ranging between eight and eighteen years of age. In Jan, 2015 there was a series of mass killings carried out by Boko Haram in the Nigerian town of Baga and its environs, in the state of Borno, between 3 January and 7 January 2015. Finally after 20th March 2015 there will be two Major events we will experience, One is Total Solar Eclipse happen in Pisces-Virgo Axis and thereafter Blood lunar eclipse will occur on 4th of April 2015, and we will see complete Transformation in Nature & Mundane world events. In October- November 2014 months there will be major changes in astronomical patterns in celestial world leads too many changes in world affairs. After 8th of October 2014 big mysteries will take new shape or might be experience within our environment or to be revealed globally in many areas of life and global conspiracy will prevail in most of the Political systems, specially it will effect Global mutual understanding and harmonic balance between countries which are earlier good in relation with each other, this will be seen mainly in those countries which are closer to Eclipsed areas i.e USA, Israel, Islamic countries, Indian Ocean, Pacific Region , Yellow sea etc. American political system undergo a major transformation in their policies and we can observe complete change in their internal and war policies toward their neighboring regions. All Eclipse will majorly impact Western Regions including Israel, Ukraine, Britain, Syria etc. & after Two Eclipses within 1 month – Total Blood Lunar eclipse on 8th of October and Partial Solar Eclipse on 23rd of October 2014 – we will see Rise in natural Disasters situations like Earthquakes, cyclones and Sudden changes in weather conditions etc. Most of Major transformations in Mundane events will be seen after 20th of March 2015 & 4th April 2015, when there will be two major events occur again within span of 15 days – One is total Solar Eclipse which will happen in Pisces-Virgo Axis Sign and last one there will be Blood Lunar Eclipse happen on 4th April 2015 on sane Virgo-Pisces Axis. 20th March Solar Eclipse will fall in ISRAEL 7th house(Opponents) and USA 8th House (House of Destruction – Earthquakes like situation can be seen after March 20th and 4th April 2015; Period of 15 days of two Eclipses) from Natal Chart. With these 4 Eclipses pattern there will be complete transformation in Political scenario of Western , European and Asian Countries directly impact whole World political scenario. There can be increase in terrorist activities, rise in frequent earthquakes, war like situations can be seen in those countries which are going to effect by these eclipses and Prophecy of 4 Blood Moons will start beginning it works after ending October 2014 and further we will see its effects after March 2015 to till year 2016. In India, New Delhi. Maharashtra, Gujarat will be under its closer Influence & Jammu and Kashmir will See New Political System in a new bottle. What world Can See and Experience ? There will be two times major Eclipses Within 1 month or duration of 15 days + Comet Movement near Mars + 4 Blood Moons in 2014-2015 + Saturn Transits in Scorpio + Rahu(North Node) Transit over Virgo (Israel Natal Chart) + There will be deep Closeness of Uranus in Pisces Sign with Venus and Mars + Grand Watery Trine Formation will rise Watery energy : Lots of Astronomical pattern will occur majorly so many changes can be expected in future. Earthquakes, cyclones, Storms, Tsunami’s & there will be high chances of collaborate fight against terrorism after June 2015 when Jupiter will move to Leo Sign and Saturn will aspect it from mutual quadrangle. There will be high possibility that all major nations like USA, Britain, Israel and other Western Countries over rise against terrorism. All Blood Moons are Passing over Israel in their Jewish years, so Role of Jewish and Israel’s people will be much seen in this fight. All actual Events Data, Images & information Belongs to www.Space.Com , timeanddate.com, earthsky.org & Nasa.gov & Wikipedia.org , Various Internet resources. While analyzing any Chart for material wealth accumulation and desires of native , Astrologer should give much priority to 11th house, 11th lord, Strength of Venus and to the sign where Venus placed and Most Important Placement and Sign of Rahu-Ketu axis.Reason Being 3rd , 7th and 11th are Kaama Trikona houses (The houses where your desire flourish) and 9th from 3rd house is 11th house – actually the Power House of Desires and the root cause of past birth, what made to soul born again to fulfill desires which are left from past. All your answers to Desires from past and present birth, Material unsatisfactory leading to continuous birth, Unfinished business from past birth , Unfulfilled Desires those are left from Past birth are hidden in 11th house placed planets, 11th lord, Venus and Rahu -Ketu axis placement and Signs. The Purpose of Life in Material world lies within our pending desires and the karmic debits and credits.In this life you can seek what you want. In order to achieve meaning and significance of life , there are four basic necessities (Dharama (Agni), Artha (Prithvi), Kama(Vayu) and Moksha(Jala) that you have to fulfill in different age patterns, every Necessity is important to fulfil the pursath.It is important to realize that all persons need to go through all the stages, and they will be left alone if they pursue and enjoy any one of the following paths in isolation, every phase is equally important to get succeed in both spiritual and mundane plane. The twin goals of any human are “Pleasure and Success”, as it leads to Moksha when they are equally satisfied ; nothing is gained by repressing these desires- in fact we might be worse if at some point we do not seek desires.Desires leads to satisfactions of goals and goals satisfaction leads to icha for Mukti and moksha. In Mundane world Pleasure, Success, Fame, Name are some of these common desires whom we want to fulfill it in any case, if you want it, go after it rather than suppressing it ; the beauty and delight is there then any soul can be easily transformed into spiritual plane but those who are keep juggling in endless desires having no goals, its very hard for them to understand what actually is their life goals or life path after a period of time.Time is the ultimate healer in understanding our true life paths and goals. Astrologically, None has any capability to answer Women’s rapid fire questions on Materials Desires because of the genetic coding and inbuilt karmic debits. “women’s are Simply Power house of Desires – Take an example of Sonia Gandhi, Indira Gandhi, Jai Lalita etc. 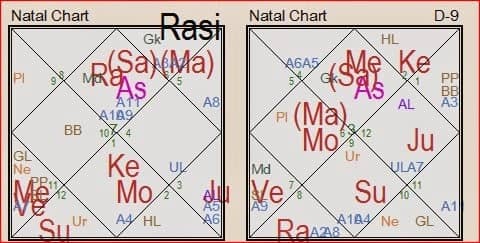 In Case of Sonia Gandhi chart Rahu is sitting in 11th house in Taurus sign – indicating Unlimited desires to gain material in this birth and she is keep adapting mean way to get and bag material in her account and she chooses this way via 5th house -( Seen by Ketu) – via followers, hidden links, by hiding identities or by her kids. So if you want to seek answers of your unfulfilled desires and Unlimited questions of your counterparts, Use the simple way to get answer. One must see below mentioned conditions then you can answer all their questions on desires, wealth and material gains. Reason being it makes me really irritated by the rapid fire questions on accumulating wealth and mundane factors from the chart, i.e when will i get settled or when will i become rich. For whole 30 years in past i was not able to find the exact answer of these types of unique questions.Another reason was there is no such direct sutras clearly speaks about the answering endless desires generates in both the genders. Till now i have seen thousands of charts from last 15 years and most of the time in my experiences, 95% of women ask usually me these unique questions oftenly, i.e When will i get settled and how ? , when i will become Super rich or Billionaire in life ?? , how long i will be rich ? and when will i have this and this and this ? ?, that and this word has no end.Another reason is there is no such word mentioned in Jyotisha system regarding settlements, financial status of native life effects because of the continues dashas and transits system, so we can’t justify the word settlement. Because it is bit dynamic in nature and it keep on fluctuating based on the good and bad dasha and transits systems.So we could never give such direct answers in straight way. Jyotisha is a science based on analysis and some mathematics and based on Sutras and principals, direct answer of the questioner has direct relation with the intuition power of the astrologer.No such tool can give direct answer regarding stability of the finance and Settlement. But finally after the years of research i was able to find out the answer for endless desires, after having research on many case studies. So, Here are the Short principals based on testing experience on many charts. First thing one should always keep in mind is that Desires has direction relation with the Kaam Trikona Houses, their Karkas (Nodes) and their lords.More the planets are placed in 3rd , 7th and 11th houses more the native will have urge for unlimited desires in current life and more the native will be materialistic in nature, Desire could be of any form.More the past birth connectivity will be there present in chart with desires, unfulfilled and unsatisfied businesses. 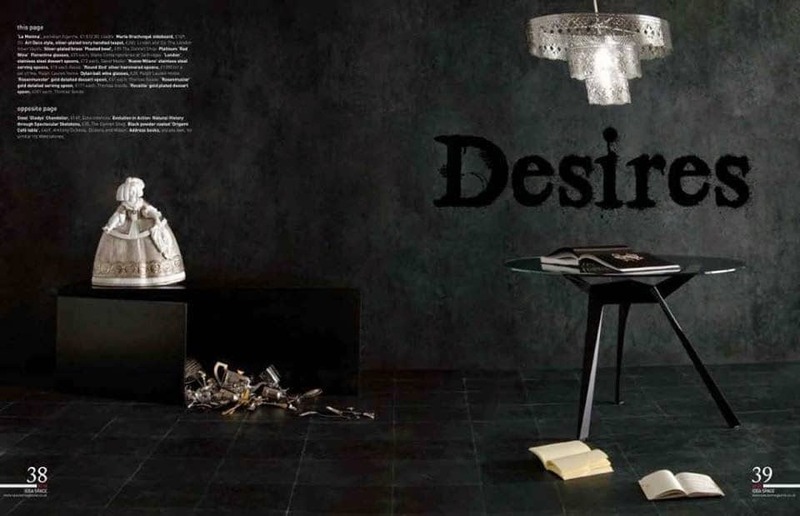 Desire could be of anything it could be falling in number of relationships or multiple relationships (karka of 7th & 11th house – 11th lord in 7th house – 9th to 11th – Past birth connectivity for falling in love or relationship with friends). It could be of knowledge, it could be of killing or having grudge of doing cruel things with intentions (6th to 6th house is 11th house), it could be of getting name and fame (7th from 5th , 11th from 1st ), it could of becoming rich like bill gates (9th to 3rd via business – past birth connectivity for establishing business with social media ).It could be of Keep trying hard for wealth attaining , Name and fame in media or masses etc (Venus and moon in 11th house) . Every answer lies in 11 house and all the Kaama trikona houses connected with it. Any Planet placed in 11th house indicates what type of desires is unfinished or unfulfilled from past birth being 9th from 3rd (which is the origin of the desires or Kama and 9th is past birth or root cause connected from past birth). Sign present in the 11th house indicates what is the seat of Desire (what sort of desire) , for e,g Aries – Power and Being born leader , Taurus – Material and wealth and Falling in relationships number of time in friend circle or social circle, Gemini – Desire for Sexual gratification and Relationships, intelligence and communication with friend circle . 11th lord Indicates what you have to do (What action is required) in order to fulfill your unfinished business or desires from past for e.g 11th lord in 12th – you need to go to abroad to fulfill your desires, 11th lord in 9th – you need to travel to spiritual places , monasteries , pilgrimages to fulfill your desires. 11th lord Sign indicates what is the desire , which made you to travel to 12th house or 9th house or what mode you have to use or adopt in order to finish your unfinished desires – If it is Libra in 12th – you need to travel abroad to get peace , balance , make relationships , make business links or establish business or to get settle in abroad by involving relationships with them and get benefit from them. Venus indicates what are the Material prospective of that desire being natural Karka of feminine , Material , luxury , comforts and Desires. For e.g, Venus in Taurus will indicates want to get pleasure and comforts from Material and wealth , Venus in libra will indicates want to make balanced relationship or to get settle in business and partnership after attaining desires. Placement of Both Rahu and ketu and its sign indicates what is the Root desires present in that house which made you keep focusing on 11th house , if Rahu is itself present in the 11th house – It indicates lots of and infinite unfinished businesses which are left from past regarding social circle, friends zone, Name and fame etc. Rahu-Ketu axis Sign indicates what are the root desires – for eg if Rahu is in taurus – Rahu wanted to earn and earn and keep earning till person never dies and get bag all those material gains and comforts in pockets till the end of life. Ketu Sign indicates what you have to do in order to fulfill that desire which is signified by the sign placement of Rahu, for e.g if Rahu is placed in Taurus, Ketu will be in Scorpio which indicates Rahu is directing Ketu to get hidden knowledge, study occult sciences, and get knowledge of ancient techniques or use hidden mean ways i.e tantra , mantra and black magic way to earn and bag all material gains or make friendship with those people who are in this profiles to get learning and knowledge from such people.Ketu always follows What Rahu giving him directions. I hope these short practically tested principles will help you to understand factor of hidden desires and karmic root connected with those from your chart. Kepler was convinced that the geometrical things have provided the Creator with the model for decorating the whole world”. In Harmonic Mundi , he attempted to explain the proportions of the natural world—particularly the astronomical and astrological aspects .Soon after publishing Harmonices Mundi, Kepler was embroiled in a priority dispute with Robert Fludd, who had recently published his own harmonic theory. Kepler began by exploring regular polygons and regular solids, including the figures that would come to be known as Kepler’s solids. From there, he extended his harmonic analysis to music, meteorology, and astrology; harmony resulted from the tones made by the souls of heavenly bodies and in the case of astrology, the interaction between those tones and human souls. In the final portion of the work, Kepler dealt with planetary motions, especially relationships between orbital velocity and orbital distance from the Sun. Similar relationships had been used by other astronomers, but Kepler with Tycho’s data and his own astronomical theories treated them much more precisely and attached new physical significance to them. Kepler discovered the laws of planetary motion while trying to achieve the Pythagorean purpose of finding the harmony of the celestial spheres. In his cosmological vision, it was not a coincidence that the number of perfect polyhedra was one less than the number of known planets. Having embraced the Copernican system, he set out to prove that the distances from the planets to the sun were given by spheres inside perfect polyhedra, all of which were nested inside each other. The smallest orbit, that of Mercury, was the innermost sphere. He thereby identified the five Platonic solids with the five intervals between the six known planets (Mercury, Venus, Earth, Mars, Jupiter, Saturn) and the five classical elements. In 1596 Kepler published Mysterium Cosmographicum, or The Sacred Mystery of the Cosmos. Here is a selection explaining the relation between the planets and the Platonic solids:Before the universe was created, there were no numbers except the Trinity, which is God himself.For, the line and the plane imply no numbers: here infinitude itself reigns. Let us consider, therefore, the solids. We must first eliminate the irregular solids, because we are only concerned with orderly creation. There remain six bodies, the sphere and the five regular polyhedra. To the sphere corresponds the heaven. On the other hand, the dynamic world is represented by the flat-faces solids. Of thesethere are five: when viewed as boundaries, however, these five determine six distinct things: hence the six planets that revolve about the sun. To emphasize his theory, Kepler envisaged an impressive model of the universe which shows a cube, inside a sphere, with a tetrahedron inscribed in it; another sphere inside it with a dodecahedron inscribed; a sphere with an icosahedron inscribed inside; and finally a sphere with an octahedron inscribed. Each of these celestial spheres had a planet embedded within them, and thus defined the planet’s orbit. the classical conception of the elements: the tetrahedron was the form of fire, the octahedron was that of air, the cube was earth, the icosahedron was water, and the dodecahedron was the cosmos as a whole or ether. There is some evidence this association was of ancient origin, as Plato tells of one Timaeus of Locri who thought of the Universe as being enveloped by a gigantic dodecahedron while the other four solids represent the “elements” of fire, air, earth, and water. His most significant achievements came from the realization that the planets moved in elliptical, not circular, orbits. This realization was a direct consequence of his failed attempt to fit the planetary orbits within polyhedra. Kepler’s willingness to abandon his most cherished theory in the face of precise observational evidence also indicates that he had a very modern attitude to scientific research. Kepler also made great steps in trying to describe the motion of the planets by appealing to a force which resembled magnetism, which he believed emanated from the sun. Although he did not discover gravity, he seems to have attempted to invoke the first empirical example of a universal law to explain the behaviour of both earthly and heavenly bodies. Kepler disdained astrologers who pandered to the tastes of the common man without knowledge of the abstract and general rules, but he saw compiling prognostications as a justified means of supplementing his meager income. Yet, it would be a mistake to take Kepler’s astrological interests as merely pecuniary. As one historian, John North, put it, “had he not been an astrologer he would very probably have failed to produce his planetary astronomy in the form we have it.” However, Kepler’s views on astrology were quite unconventional for his time; he argued for a system of astrology based largely on harmonics, a type of ‘planetary harmonics’ based almost entirely upon the astrological aspects and what has been traditionally been termed “the music of the spheres.” Information relating to his theories can be found in his book Harmonice Mundi. Kepler believed in astrology in the sense that he was convinced that astrological aspects physically and really affected humans as well as the weather on Earth. He strove to unravel how and why that was the case and tried to put astrology on a surer footing, which resulted in the On the More Certain Fundamentals of Astrology (1601), in which, among other technical innovations, he was the first to propose a number of new aspects such as 18°, 24°, 30° (semisextile),36°, 45° (semi-square), 72° (quintile), 108°, 135° (sesquiquadrate), 144° (bi-quintile),and 150° (quincunx). In The Intervening Third Man, or a warning to theologians, physicians and philosophers (1610), posing as a third man between the two extreme positions for and against astrology, Kepler advocated that a definite relationship between heavenly phenomena and earthly events could be established. At least 800 horoscopes and natal charts drawn up by Kepler are still extant, several of himself and his family, accompanied by some unflattering remarks. As part of his duties as district mathematician to Graz, Kepler issued a prognostication for 1595 in which he forecasts peasant uprising, Turkish invasion and bitter cold, all of which happened and brought him renown. Kepler is known to have compiled prognostications for 1595 to 1606, and from 1617 to 1624. As court mathematician, Kepler explained to Rudolf II the horoscopes of the Emperor Augustus and the Prophet Muhammad, and Kepler gave astrological prognosis for the outcome of a war between the Republic of Venice and Paul V. In the On the new star (1606) Kepler explicated the meaning of the new star of 1604 as the conversion of America, downfall of Islam and return of Christ. The De cometis libelli tres (1619) is also replete with astrological predictions.